On Saturday afternoon we went to Manchester to review DogBowl for What's Good To Do. DogBowl combines the fun of a 10 pin bowling alley with a trendy city bar and serves a great range of Tex-Mex style food. It is located in the railway arches underneath Oxford Road station so it is very easy to get to by train or for those like us who drive into the city there is plenty of parking close by. We visited DogBowl at 5pm on a Saturday afternoon and when we arrived the bowling lanes were already quite busy, although the bar and restaurant were still pretty quiet. We were asked to write our names on a piece of paper and whilst we were putting on our shoes our names were set up on the computer so we could start bowling straight away. 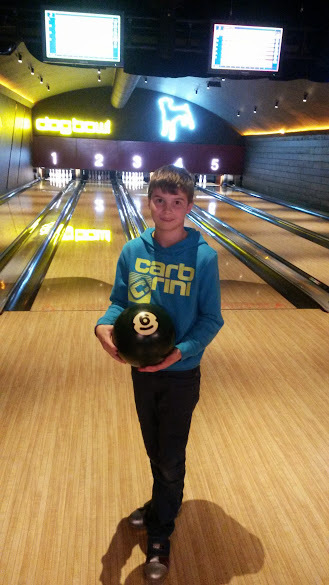 Having bowled before we knew that Luke would need the buffers and when we asked for them to be raised we discovered that the system could be set just to raise them for specific players which made the game more competitive. There are 5 full length lanes and all of them were in use whilst we were there. The alley was spotless and had plenty of bowling balls in a good range of sizes. There were also a couple of the metal guides available for younger children. There was plenty of seating available and tables for drinks and I noticed that empty glasses were quickly cleared away and tables wiped which kept it looking tidy. We all really enjoyed our game and it was a much nicer atmosphere than the usual warehouse style of bowling alley. DogBowl also do special offers and the current offer on their website is children bowl free on Mondays, unfortunately it is too far for us to go after school but I would certainly consider visiting in the holidays. Once we had finished our game we were shown to our seats for our meal, we sat at a large table in the window which was very comfortable and a good size. There was background music playing which was not intrusive and created a great atmosphere. The children’s menu costs £6.50 for a starter, main, dessert and soft drink. There is a variety of choices and Luke quickly decided on the BBQ wings, Cheese Burger and Ice Cream. Refreshingly DogBowl have chosen to offer the same high quality food to the children as they do on the adult menu, just smaller portions. Too many places resort to chicken nuggets, pizza or cheap sausage and chips and it was nice for him to eat the same tex mex flavours along with us. There are lots of delicious dishes on the menu, we chose chicken wings, chicken strips and a smoked sausage dish for starters. They were all very nicely presented and tasted delicious. The chicken strips came with a Blacksticks Blue cheese dip which complemented the chicken perfectly. When ordering our main courses Mark ordered the rack of pork ribs and we were warned that this dish would take a little longer to prepare, we were fine with this but it’s always nice to be told. As it was all the main courses were served quite soon after the plates for the starters had been cleared away. 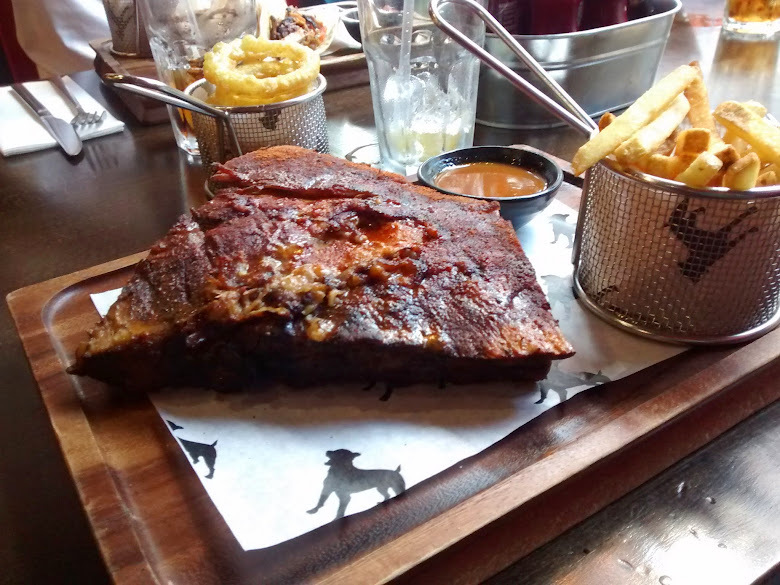 The pork ribs were super succulent and served with chips and a BBQ sauce. We all had a taste and they were quite simply the best ribs that any of us have ever tasted. He also ordered a side dish of onion rings but we should have ordered two as they were quickly shared around the rest of the table! I ordered a pulled pork sandwich which was full of pork and served with slaw and fries. The pork was absolutely delicious and the fries were cooked perfectly. William ordered tacos, which was something new for him but he really enjoyed it and said he would order them again next time we visit! The only criticism we had was that following our main course we were left for quite some time and had to ask for Luke’s ice cream to be served. The ice cream was worth the wait though as it was a good quality vanilla ice cream and he quickly finished it off. By the time we were leaving the bar area and restaurant were getting much busier, it is obviously a popular venue for both food and cocktails. Bowling Alleys are notoriously bad when it comes to food so DogBowl is the perfect solution - you get the fun of bowling but the food and atmosphere of a city centre restaurant. We all had a great afternoon out and would thoroughly recommend visiting. 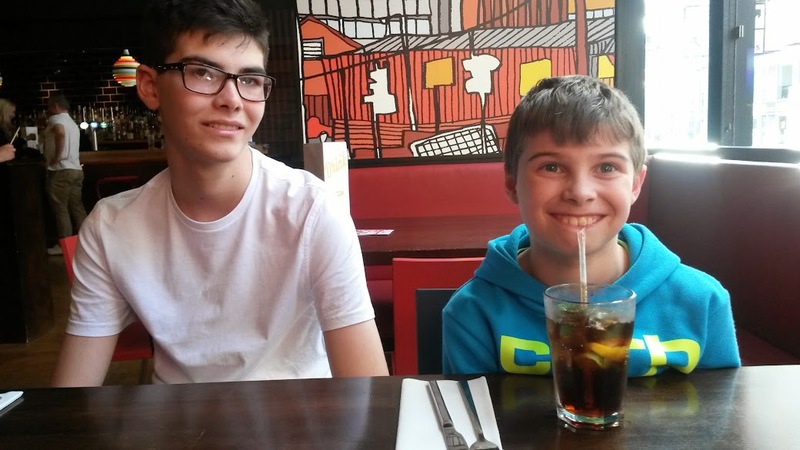 William and Luke are already asking when we can go back as they enjoyed it so much! Disclaimer - we received one game of 10 pin bowling and a meal for the purpose of this review but all words, photos and opinions are our own.